Rethink your home decor and get inspired by the cool, bright colors of summer. See how easy it is to refresh your home for summer by bringing in cool colors, accessories, and a few collections. Even none summer lovers can do this. All it takes is some creativity, so let's get started! This post contains affiliate links. That means if you click on one of those links, I will receive a small commission. You won't be paying a penny more, it just means I will make a little money for your purchase. Summer is the time to lighten your decor with cool colors and natural elements such as plants, driftwood, and seashells. Blue is my favorite color and also reflects my love of the ocean. 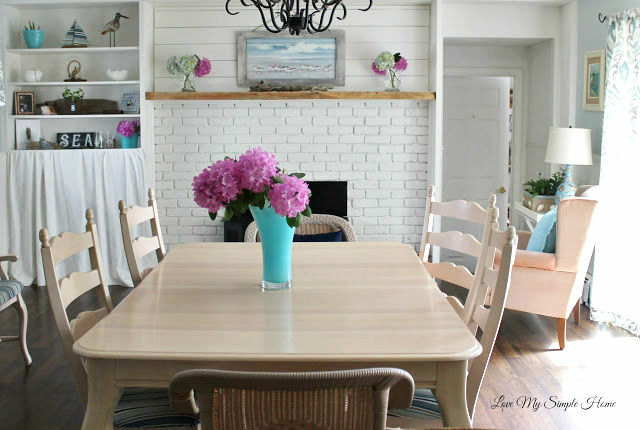 You will see a lot of blue in our home, it is my go-to color for paint and accessories. Let's talk bookshelves...Use found objects collected on the beach to decorate them. If you have a collection use your collection as art. I like to collect driftwood, seashells and beach glass. Try leaning a couple of pieces of driftwood against the wall of a shelf for instant art. Cloches are a favorite of mine, you can display anything inside them. I displayed a starfish and a small rope found on the beach inside mine. Seashells are easy to come by when strolling along the water's edge. Display them in glass jars or simply place them on a shelf. If you are crafty, show off your work on a shelf or two. The driftwood sailboat, driftwood SEA sign and feather print on canvas were made by me! I purchased cotton branches from Decor Steals. You can find the link here. They offer home decor and vintage reproduction products at incredible savings of up to 80% off retail. There are so many ways to use these branches. I arranged mine in three clear glass bottles and added beach grass from my yard for a summer feel. This is my favorite nook in the dining room. I made a side table using a wooden TV tray with a mirror on top. Now I have a place to hold a lamp and some pretty summer flowers. I made the planter out of a cardboard box and used seashells to decorate it. The photo on the wall was taken by me. It is my favorite one of our daughter when she was little. The curtains have all my favorite summer colors. Stock your kitchen cabinets with summer essentials and use baskets to contain drinks and snacks for on the go. My antique medical cabinet packs a lot of summer goodies. Flowers are always around in the summer, clip a few and display them on your kitchen table along with fresh fruit for snacking. I hope you leave here refreshed and inspired to give your home that summer love!